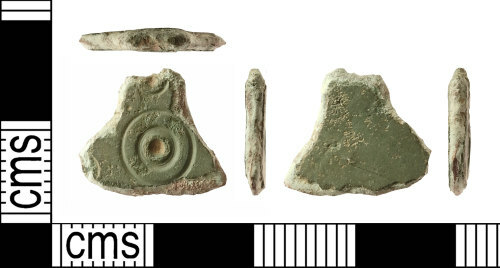 A fragment of an Early-Medieval (Anglo-Saxon) small-long brooch (c. 450-c. 600). This flat fragment is the lower part of the foot. The sides flare outwards and downwards towards the bottom. The front face has two ring-and-dot motifs, one above the other. The upper motif has been truncated by a transverse break. There is also a truncated ring-and-dot motif at the left lower corner. The rear face is plain. The brooch has a dull green patina with traces of a white metal coating/wash at the front. The break at the top is old and the edges are abraded. Length: 12.7mm; width: 14.6mm; thickness: 2.0mm. Weight: 1.26g. Small-long brooches have been published (MacGregor and Bolick 1993: 124-147).